~ by Dawn Elliott on July 28, 2011. Gorgeous haiku! ‘Vivid colors feed my soul’… I love that sentence! I might use it on one of my art journal pages… if that’s OK with you? And this is where her Soul lives and thrives. Such a beautiful place. The Wall a green crush of color, lavenders and reds gracing the surrounds and a chair made of tree twigs with a sweet bright orange pillow. One could sit in this corner of the world forever. Lovely. Now I could live in those colors. Just beautiful Dawn. I love those words, “Vivid Colors Feed My Soul.” That’s very intense. I know that’s the way I feel. Thanks for sharing. Have a great weekend. And your vivid colors feed my soul, too. How I hope I get to see your studio one day. I just love your website and your style, as I keep telling you. Hi Dawn! This is so beautiful! Wonderful energy is just popping out of this space! 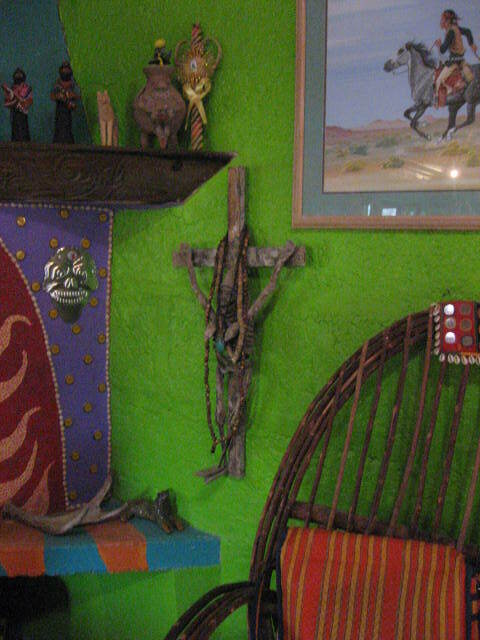 So many elements working together to create an atmosphere that makes your spirit thrive–the wood, the crucifix, those colors-textures-patterns, that lime-green wall, the energy-flowing movement of the horse, the wisdom of the coyote, the native people, the antlers… Your personality’s unique feng shui, recognized and honored in this place and in your haiku. So incredible what you’ve created intuitively for yourself–you inspire me! so wonderful for you to write a haiku inspired by anado’s house. no one does colour quite like that colourlicious genius. i feel san miguel bright in our future! I like your willow chair with the bright color back drop and I enjoyed your vivid colorful words. oh I want to return to the land of magic, color and art! !